For Deke‘s review over at Arena Rock – Thunder Bay and Beyond, click here! Forget about the edge of the desert; the drugs had already taken hold. Aerosmith managed to keep it together on Draw the Line long enough to put out an album that was good enough if you squinted. Infighting, missed gigs and long, overbudget recording sessions were the order of business. It’s just another chapter in the same old rock and roll story. It looked like Aerosmith would be one of those bands that just burned out before the end of the 1970’s. With half the album finished, Joe Perry quit Aerosmith. Packing it in wasn’t an option financially so Jimmy Crespo, a session player, was hired on. A number of guitar players finished the album, Right in the Nuts Night in the Ruts, a collection of songs that probably wouldn’t have been considered for previous albums like Toys in the Attic for reasons of quality. Things got off to a strong start with “No Surprize”, a song telling the story of Aerosmith’s beginning, and featuring Joe Perry on guitar. This is a standard 1970’s Aero-rocker, with no surprises (pun intended). You wouldn’t know anything was wrong with Aerosmith by the sounds of it. The playing is faultless (particularly drummer Joey Kramer’s) and the song is well constructed. “Chiquita” is second, and I can’t help it but I always think of bananas. There’s a groove and some catchy brass parts, but nothing that coalesces into an album-quality song. It doesn’t particularly matter though when you’re Aerosmith though! “Chiqita” is a lesser known highlight regardless of its faults. Because of its placement on the later (and more well known) album Aerosmith’s Greatest Hits, I’m used to “Remember (Walking in the Sand)” being a closing song. I’ve always found it to be a dramatic and classic Shangri La’s cover, but placing it right dead center of side one doesn’t sound right to me. It’s also worth pointing out that this is the first of three covers on Night in the Ruts. Coming up with original material must have been a struggle since the album is 1/3 covers. “Cheese Cake” piles on the slide guitar, one of Joe Perry’s brightest talents. Because of his eloquent slide work, “Cheese Cake” is one of the best tracks. I’m pretty sure the lyrics are not about cake. For extra coolness, check out the Aerosmith Pandora’s Box set. “Cheese Cake” is sequenced with “Let it Slide”, an instrumental demo highlighting Joe’s guitar work. Onto “Three Mile Smile”, Aerosmith managed to come up with a funky groove but not much of a song. Once again on the box set, it was sequenced with an instrumental demo (“I Love in Conecticut”) that highlights the playing. Too bad they weren’t focused enough to turn it into a killer song. A blues cover, “Reefer Headed Woman” kills four minutes, but without focus. The thrill is gone. Tyler remembered his harmonica that day at least; he sounds completely out of it otherwise. If you want some of that old Aerosmith chug, then look no further than the vicious “Bone to Bone (Coney Island White Fish Boy)”. For the first time since “Cheese Cake”, it sounds like Aerosmith have ignited the way they used to. “Bone to Bone” hits all the bases, leaving one so frustrated that they couldn’t do it more often on this record. That’s it for the Tyler/Perry originals. A Yardbirds cover “Think About It” isn’t particularly memorable and Tyler lacks energy. Steven wrote the closing song “Mia” for his daughter, and per the Aerosmith pattern, it’s a piano ballad to close the album. I want to like it more than I do, but like much of Night in the Ruts, it sounds half-finished and tired. It’s frustrating since the Aerosmith discography up to this point has been largely consistent. 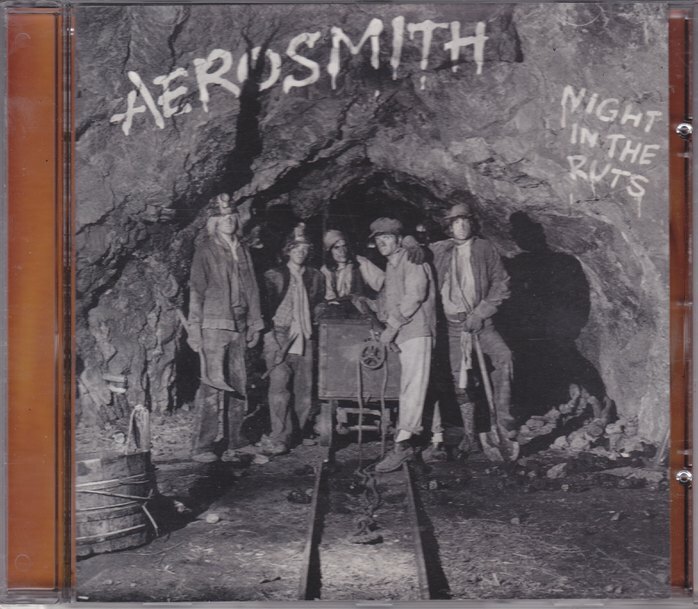 Night in the Rights represents the start of the “dark times”, a period where Aerosmith had lost two key members and were in danger of losing their singer to his own demons. Well said Mike…indeed the Aeroship was taking on water at this point! For some reason though this half baked album of goodies I still dig considering they were in shambles! By the way the layouts of your posts with the sleeves and pics is mint thanks man and great job! The Aeroship was leaking fast! Great collection of reviews! I loved reading each one. I recently purchased Night in the Ruts to round out my collection. I expected, from everything I’ve ever read, a stinker. I was pleasantly surprised to discover an underrated gem. Song for song, it’s the worst of their classic albums. But sometimes, the sum is greater than the parts. Subsequently, I find Night in the Ruts to be a more engaging listen than Draw the Line. I give it four stars, even though I agree with your review. Thanks Chris! Even though it’s a lot of work and focus, I enjoy doing a series like this. I’m with Deke and Chris. I agree with your review but I’m pretty fond of this one despite its flaws. It’s under-rated. I do find it a bit more satisfying than Draw the Line. More of a feel-good album maybe? I used to put this one on a lot before I headed out to the pub! Good pub music for sure! And Coney Island is great for getting the blood pumping! Enjoying this series, Mike – another fine review and an enjoyable read. Right in the Nuts indeed! Ha! You know what? I have never heard this record ever. Not one second. But I just watched the video and No Surprise is a damn fine song even though Tyler is off key here and there. That said, that album has one of the coolest titles ever. I guess I must see if I can download it from somewhere and check it out. Great write-up as always, dude. Thanks! Yeah you may as well check this out for the sake of hearing it for the first time. I guarantee there will be a song or three that you like. Thanks STC! Yeah there are definitely some “lost” discs in this Aero-period. But good stuff hidden between the cracks. Mike, this post is so spot on. I can’t think of anything more to add. Night In The Ruts by Cunning Stunts. Missed opportunity, there. Ha! I remember reading about this period, whoa. That they could still put out a record that gets a Lebrain 3/5 (if he squints) speaks more to the inate talent of the band than any real sense of purpose, direction or togetheress at the time. Nah, I think this is a much better album that it gets credit for! All downhill from here though, but No Surprise might be one of their best songs ever.